They don’t make ’em like they used to. You can still pick up your grandpa’s old analog multimeter at any hardware store or on the internet, and they’ve still got their uses. Today’s best multimeters are all digital and they dominate the market. With a numeric display that reads out your measured value as precise as can be, it’s no wonder that the old analogs have fallen by the wayside. But what do the symbols on a multimeter mean? Don’t worry about it, we’ve got your back. How Do I Read the Symbols On a Multimeter? Let’s start simple: a multimeter is a tool that electricians—or anybody that needs to—use to check the current (in amps), the voltage (in volts), and the resistance (in ohms), of a device that outputs electricity. Multimeters come in analog flavors, as mentioned above, and use a needle to provide readings—but digital multimeters are far more common. The various buttons that operate the tool. A rotary dial that allows you to select what unit of measurement you’d like to use. Input ports to insert your test leads into. 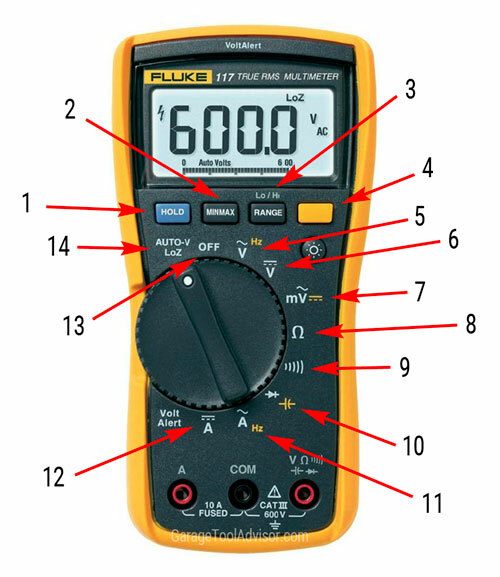 Fortunately, the current symbols on multimeters have been more or less standardized by one of the most popular brand of multimeters, Fluke. The only difference that you’re likely to see between multimeters are extra symbols around your rotary dial, which you can read by using your function/shift button (#4 below). When you’ve taken your reading, you can press the hold button to lock in your measurement. This is extremely useful if you need to have the measurement on hand while you work on your project. Save input values. The multimeter will beep when a high/low value is exceeded and the new value is saved. Allows you to click through meter ranges. Allows you to activate secondary functions around the dial usually indicated with yellow text or icons. Comparable to a Ctrl or Alt key on a keyboard. Denoted by a capital V with a wavy line on top. In a circuit diagram, however, voltmeter symbols are usually represented by a capital V inside of a circle. This is the setting that you’ll use more often than anything else, and it measures the voltage of the object that you’re working with. Denoted by a capital V with three hyphens above it and a single line on top of that. Think of it as a V with part of a road above it. You’ll make use of your DC voltage button when you’re measuring smaller circuits. Denoted with an mV and a squiggly line on top tests smaller circuits using low AC voltage settings. Similarly, there’s the DC millivolts button, three hyphens with a straight line over them, and is usually right next to the AC millivolts button. You’d use the Function button to switch to the DC setting. Looks like an omega letter and measures ohms to help you get an accurate resistance reading. It can also help you determine whether or not a fuse has blown by displaying the letters OL. Denoted by the symbol you usually see to indicate sound waves. This measures whether or not two points have a continuity, and it’ll help you determine whether or not you have any open or short circuits. Denoted by an arrow pointing right with a plus sign beside it. Determines whether or not you’ve got a good or bad diode. Denoted by a capital A with a squiggly line on top, which can measure the load that an object is using. Denoted by a capital A with three hyphens and a line above it. Measures the direct current of the object you’re working with. Found on some models, it prevents false measurements because of ghost voltage. Hopefully, this guide has helped thoroughly unriddle the complex functions of a multimeter so that you can make the most of it on your next project. While this device may look complicated, if you stick to the basics, you’ll become an expert in no time. This is actually helpful. Thanks for putting this together.